Enjoy your vacation in CASA CAMPO in beautiful and peaceful surroundings with your own swimming pool, large open garden, covered terrace and within walking distance from a cosy Catalan village, where the early riser can get the croissants in the bakery and the teenager can use the Internet in the bar at the square. At the weekly market one can buy the delicious local food, fruit and vegetables. The house has a beautiful interior, with nicely decorated rooms and two kitchens. The cosy living room of CASA CAMPO provides a pleasant retreat if it gets too hot outside in the summer, or around the fireplace in the winter.The 17 beds are placed in 5 double rooms, 1. single & two triple bedrooms. The entire house has been restored with great respect for its history. The rooms are nice and large and the dining area and lounge is open, light and really pretty decorated. The garden is large and you will find a large covered terrace, several outdoor seating areas and a large and fenced swimming pool. Lay out of CASA CAMPO: The house has 3 floors. The ground floor has a welcoming hall with lounge 2 double room with double bed, 1 triple room with three single beds and 1 double room with two single beds. Here is also 2 bathrooms (1 with bath tub and 1 with shower) a Kitchen and a large common room with fire place. On the first floor is - 1 double room with double bed, 1 individual room, 1 double room with two single beds and 2 bathrooms (one with bath tub and one shower). Here you will also find another Kitchen and another common room with fire place. On the Second and last floor is a Plateau and a Attic with a double bed. In the garden is a covered gameroom a chill out area and a covered terrace with BBQ. Central Catalonien: Central Catalonia is situated where the Llobregat-river winds it is way from the Pyrenees down towards Barcelona. It is not heavily populated, and in the small town and villages you blend in with local life. The region is ideal for families or groups, who want a diversified vacation. Central Catalonia is situated in 400-800 meters altitude and has more than 300 sunny days on a year. If you visit the region in the spring or the autumn, most days will be pleasant, with temperatures from 18-25 degrees in the day time. In the summer it is warmer. The altitude makes the air dry, and the heath is very pleasant. It is good idea, however, to have the lunch-break in the shadow. The region's houses are constructed of limestone and with tiled floors to secure a pleasant indoor temperature. Central Catalonia is an inland area and has a rich cultural and natural heritage, including market-towns and cities with a great historical tradition. Catalonien: Discover the Catalan soul in a historical, carefully preserved but modernized country house. In comfortable distance from the crowded beach resorts, but still with the metropolis Barcelona, lively historical towns as Girona, Tarragona and Vic and the natural parks in The Pyrenees within short reach. We offer vacation in your particular pace, where you blend in with the open-minded and friendly Catalans. Enjoy the silence in the small hills in the pre-Pyrenees. Enjoy sports and outdoor activities as walking, canoeing or mountain biking. Or scamper about in the lively street- and café life in the Catalan towns. Here you will discover gastronomic, cultural and artistic impressions that stick. As something new we can also offer apartments i Barcelona and many more are coming. Or how about watching a football match along with 98.917 other spectators on FC Barcelona's legendary Camp Nou? The best advice is to come to Catalonia and see for yourself. 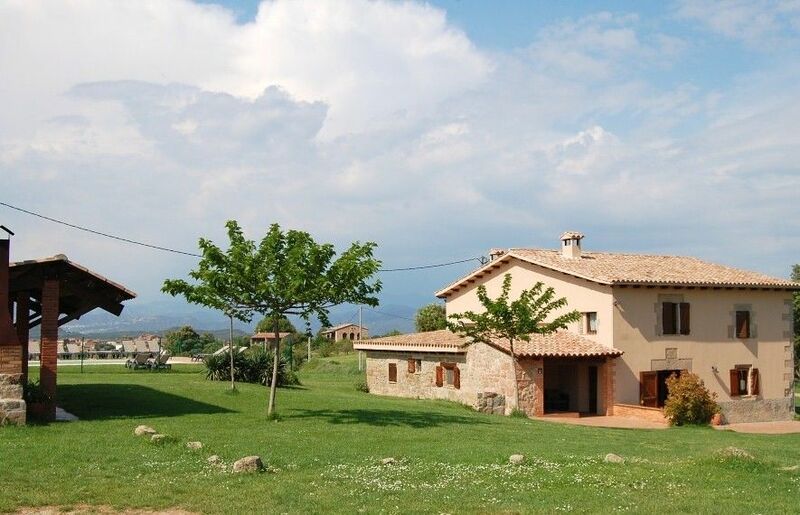 Discover the Catalan soul in a historical, carefully preserved but modernized holiday home in Catalonia, Spain. In comfortable distance from the crowded beach resorts, but still with the metropolis Barcelona, lively historical towns as Girona, Tarragona and Vic and the natural parks in The Pyrenees within short reach. We offer vacation in your particular pace, where you blend in with the open-minded and friendly Catalans. Enjoy the silence in the small hills in the pre-Pyrenees. Enjoy sports and outdoor activities as walking, canoeing or mountain biking. Or scamper about in the lively street- and café life in the Catalan towns. Here you will discover gastronomic, cultural and artistic impressions that stick. As something new we can also offer apartments i Barcelona and many more are coming. Or how about watching a football match along with 98.917 other spectators on FC Barcelona's legendary Camp Nou? The best advice is to come to Catalonia and see for yourself. The number of persons included is 17 people. Extra beds available against supplement. There are also cot(s) available on request. Price includes: National taxes and VAT, electricity, heating, water, bed-linen, towels and cleaning at departure. Not included: Catalan tourist tax: € 0,5/adult(+16)/night. PLEASE NOTE: *At Catalan holidays in low- and medium season supplements may apply.